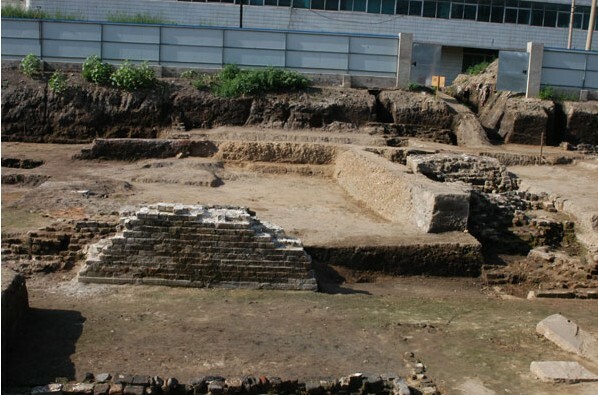 In order to match the requirement of basic construction, from May to August, in 2012, Shenyang Municipal Cultural Relics and Archaeological Research Institute conducted a series of excavations at the Beizhong Street of Shenhe District, where a group of buildings from the early Qing Dynasty were found. 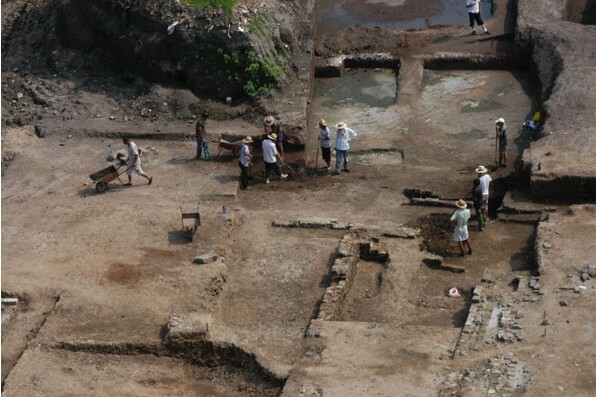 A total of 1,600 square meters were excavated. According to historical records, with the evidence of unearthed architectural enclosing wall and remains, this group of architecture must have been the Khan’s Palace site. The Khan’s Palace was built by the first founder of Qing Dynasty, i.e., Nur Rihachi, after the movement of capital to Shenyang during the fifth-year of Tianqi Emperor of Ming Dynasty (A.D. 1625). This group of buildings is situated at the Beizhong Street to the north, and Jiumen Road to the south. To its north, the architecture was facing to the Jiumen Site of Shenjing City of Qing Dynasty, and Tongtian Street to its south. With the evidence of investigations, facing to Jiumen Site on its central axis, external walls of the northern enclosing wall of the architecture only had 10.6 meter distance from the surface of internal walls. Oriented from the north to south, the site is consisted of Duplicate courtyard, 41.5 meter in length. Due the badly damage on both sides to the east and west, it is difficult to assure its width. In the first courtyard, there only remain a gate and southern enclosing wall, without any other contemporary building. Facing the south, the large gate has three stone-bases of the column on both sides to the east and west. The three stones-bases were lined up on both sides from the north to south. The middle stone-base was built inside the door side-wall. The stone-bases differ in shape, with four rounded, one round-angled square, and one irregularly rectangular dimension. Therefore, the gate may have measured 3.4 meter long from the east to west, 3.4 meter long from the north to south. This kind of gate, broad and bright, may have been used especially for the elite people of Qing Dynasty. The west side of the courtyard was disturbed by two houses foundation of the late Qing Dynasty, while its east side was disturbed by a high platform from later period. Within the first courtyard, the southern enclosing wall measures one meter wide, 17.75 meter preserved from the gate to the west, and 8.4 meter to the east. The enclosing wall to the east and west side had remained almost nothing. Southern wall only preserved with two layers of bricks. The blue bricks on the bottom were erected and stacked one by one, with the upper layer of blue bricks horizontally placed, outlined by the clay. Walls were lined by bricks all over the four-side surface, with the central part filled with fragmentary bricks. This construction theory is that walls were enclosed by the bricks, prevalent during the Ming-qing Periods, called “gold inlaid with the jade”. The second courtyard is situated on the elevated platform, with its doorway facing the gate of the first courtyard. The east side was disturbed by a later platform building. The doorway with stairs has been preserved only a layer of blue bricks vertically placed, parallel with the elevated platform. In front of the stairs, there has been a rectangular brick-paved floor, remaining one meter wide from the north to south, 2.7 meter long from the east to west. As presumed, the length from the east to west would have been equal to the width of rammed earth of the platform, which is 5.6 meter. The remaining platform is 1.5 meter higher than the floor of first courtyard. With the evidence mentioned above, the second courtyard may have been constituted of many stairs, by which people walked upward and entered the second courtyard built in the platform. The platform foundation is consisted of several brick-built and rammed earth platforms from the north to south, and east to west. Four brick-built bands from south to north and six brick-built bands from east to west together constitute the frame of platform foundation, amongst which three rammed earth platforms support the frame of the Duplicate courtyard together. The brick-built platform measures 23.5 meter long from the north to south, and ca. 46 meter from the east to west. The base of elevated platform is characterized of the construction of earth enclosed by the bricks. This method of construction specifically means that three earthen platforms to the east, middle and west were built first of all. After that, these platforms may have been lined by the blue bricks of more than three-meter wide. The external side of bricks was mostly built with fine bricks, outlined by white plaster, while the internal part mostly was filled with broken bricks one layer after another. With differing location, material of brick and building foundation differ one another. The main building of Duplicate courtyard over the elevated platform has disappeared for a long time. We found the northern enclosing wall of the Khan’s Palace situated at 0.9 meter from the elevated platform to the north. The construction of this enclosing wall may be the same as that of the southern enclosing wall of the first courtyard, i.e., walls enclosed by bricks, 1.4 meter in width. There have been a great quantity of architectural components and bronze coins of ‘Tianming Tongbao’, found in the building deposits after it abandoned. The most significant discovery is that a great number of glazed building components were found, including plate tiles, semicircle-shaped tiles, drip ends of the eaves, flower-shaped bricks, bricks decorated with bead string pattern, and brick sculpture. All the items were conducted with green glaze. Rounded semicircle-shaped tiles, surface of drip ends tiles as well as part of imprinted flower bricks were all decorated with lotus petals. With all the evidence talked above, we have known that the location of excavated buildings may have been consistent with where the Khan’s Palace was after the literal records. Especially, the size and form of the buildings are consistent with those of the Khan’s Palace. Technique and material adopted by the buildings is characterized of the late Ming and early Qing Periods. The remains recovered from the excavations indicate the rank of the first founder of Qing Dynasty, Nur Rihachi, and feature at that time. The excavations of Khan’s Palace do confirm the real existence of the Khan’s Palace, indicating the appearance of the Palace as it has preserved. Meanwhile, the existence of Khan’s Palace let us get known of the importance of choosing its location. The construction of the Khan’s Palace is contemporary with that of large main hall of the Shenyang’s Imperial Palace. The relationship between these truly indicates the architectural imperial feature of Manchu people, i.e., the separation of the palace and hall.